With the coming of spring, many of us start of think about our gardens. Why not try to add a beautiful helper to your garden this year? Try attracting the Eastern Bluebird to your garden. These beautiful red (rust really), white, and blue native birds are a natural insectivore for any garden. Simply put, bluebirds will help control the insect pests in your garden. Bluebirds require very little to make your garden their nesting home. There are two necessary items for successful bluebird habitat. Second, you must not use any insecticides or chemical fertilizers on your garden or yard. This is important because bluebirds (and other beneficial animals) eat bugs. If you use chemical insecticides and the bluebirds eat an insect which has been treated with chemicals, the bluebird will die. This is a lesson that has been hard learned by gardeners. But thanks to education, most people no longer use chemical insecticides. You will find that reliance on Mother Nature’s insect controllers, such as toads, lizards, birds and bats, that many insect problems can be naturally controlled. 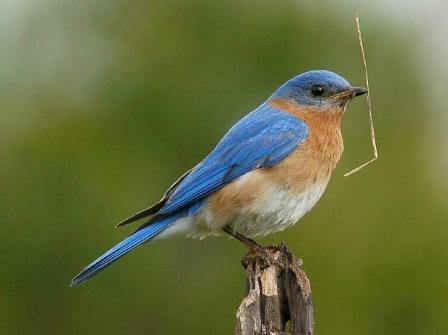 I have even observed a female bluebird feeding fire ants to her young, with no ill effects to the birds.